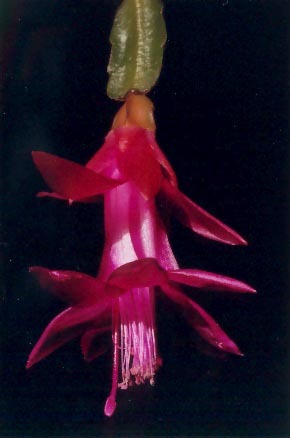 Schlumbergera russelliana was chronologically the second to be discovered ; it was described in 1837. 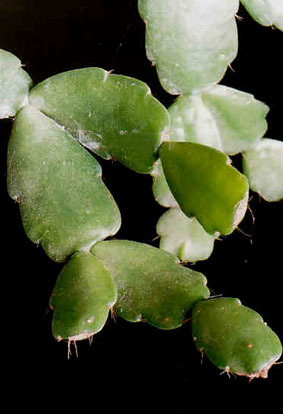 Its stems have a rounded form (looking like the form of the stems of the Easter Cacti) and are the smallest stems of all Schlumbergera. Books of reference mention that they are 2.5 cm long and 1 cm wide. The bloom is the only Schlumbergera flower which is not zygomorphic but actinomorphic. It’s approximately 5 cm. long. The fruit has an angular form, as can be seen on the photograph. The blooming period in the northern hemisphere takes place from February to April. The hybrids of S. truncata and S. russelliana gave the group Schlumbergera x buckleyi, our grandmothers’ Christmas Cacti. Depending on whether they are closer to one relative or the other, they have notched or rounded stems and pink or white stamens, as well as a more or less later blooming period.